In my Graphic Design II class, we were assigned a project where we were to create a poster and a VHS box, because nostalgia, for a movie or show of our choice. 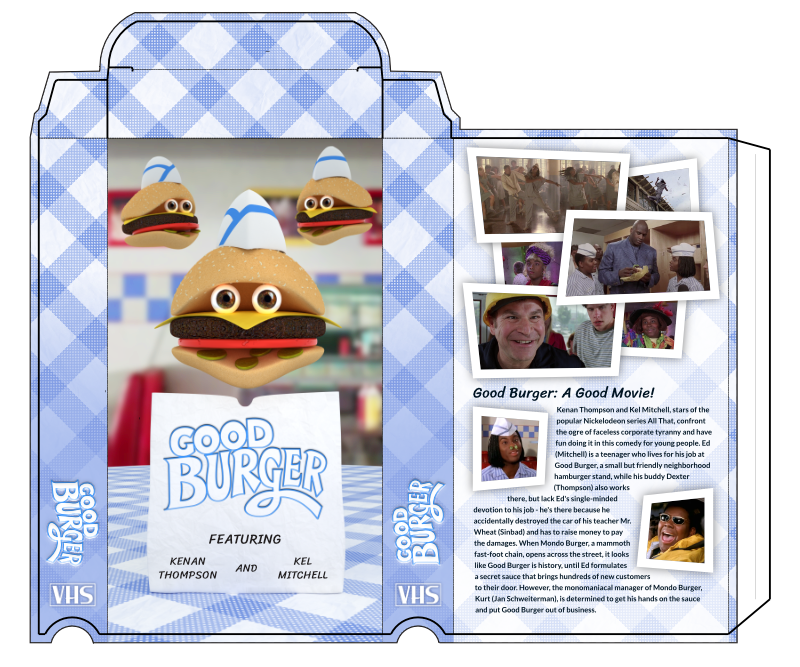 I chose Good Burger (which happens to be on VHS) solely so I could put some of the most silly quotes from the movie on the back of the VHS tape, in place of where reviewers' quotes would go. When I started this project, I knew that I wanted it to be in 3D. 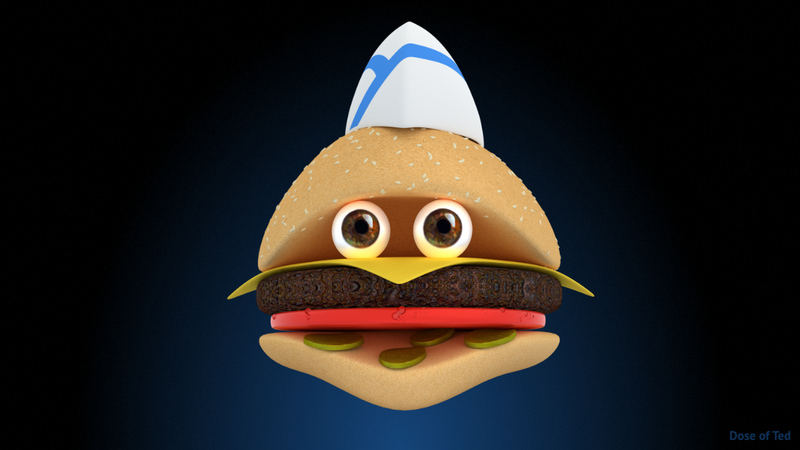 I wanted to get more experience with 3D modeling, and textures, UV unwrapping, and compositing, so I took to Blender and started modeling a simple burger. After watching a clip from the movie where Ed flies with little burger puppets (definitely worth a rewatch). 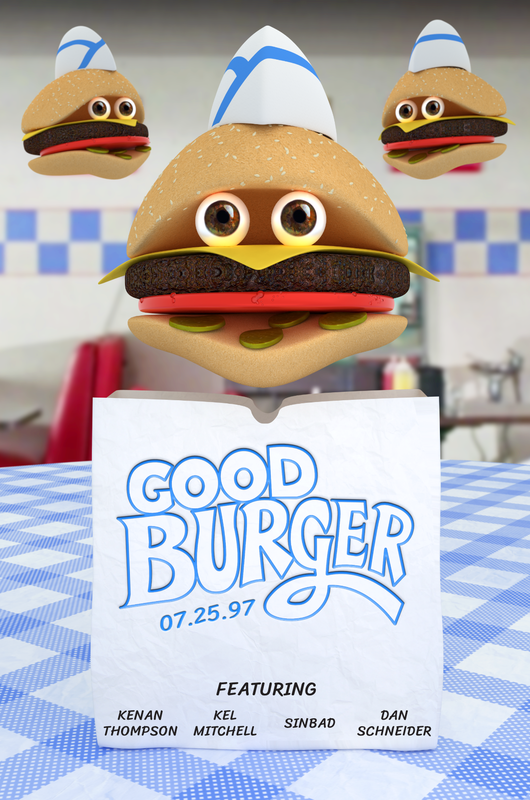 I gave my plain, simple burger two eyes and a cute little, but admittedly crude, “Good Burger” hat. I created some textures like the tablecloth, pickles, and the eyes, and downloaded others like the cheese (crumpled paper), meat (actually a piece of bread), and bun (sandpaper). I also traced a logo from the movie that I really liked and slapped it on the bag. After creating the poster, I created a process presentation (which you can see here) and put my burger on a simple background. I really liked it and decided to make this my wallpaper and have made it available to download here if you'd like to make it yours. 21 Years Later… Coming to VHS (again)! After finishing the poster, I created the VHS cover with a template provided by my teacher. I used all of the resources from my poster and put together some shots from the movie (I technically had to rewatch the movie, right?). This was a fun project that allowed me to improve my skills with 3D work, which will come in handy for a future game I am planning (details to come if I decide to move forward).